On Thursday my French class resumed after the Easter hols and we were given more poems. Prof would like us to write what we think about a poem called A man and an ant! written by Alain Bosquet. Well we read the poem and even when we understood all the words and phrases there are chunks of it that make no sense at all! So I searched for another which I like instead, not keen on ants this week! This stone is a sleeping frog. The sky, it is very fragile silk. The ocean when it is afraid, it shouts. I do not say anything, like a mouse. The dream of a child it is a law. Sometimes it is good to see the world like a child. 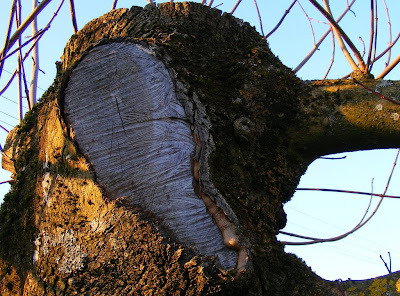 In January I saw what was left of this tree and thought I saw an elephant. The French Slang word for eyes is mirettes....I like that word. Funny we looked at it and saw a duck - but there you go!! Love that quote! It is so true - we should always always see the world as kids see it: so full of miracles and wonder! Oh yes I see the elephant! Beautiful poem. We need to remind ourselves to see like a child. TF ~ Grow up never. Clive ~ Duck..I have gone quackers looking for the duck. Robyn ~The poem is actually nicer in English! It's definitely a baby elephant! How cute. R and I hate driving, so on long road trips we sometimes pass the time by spotting things in clouds and quizzing the other (no accidents so far!). My children help me see things all the time. my youngest son takes the most amazing photos from the eye of a child.